Fr. 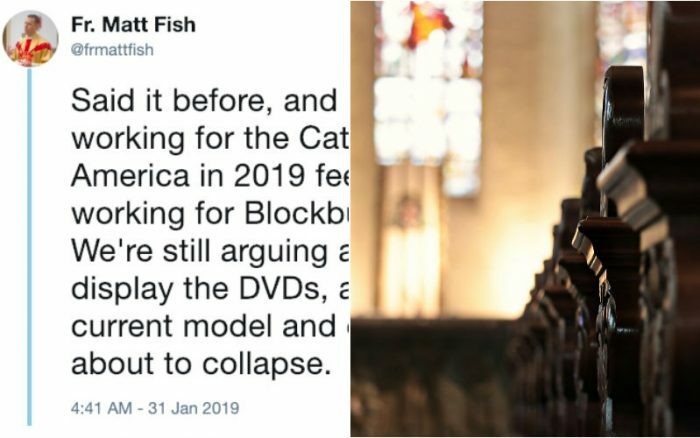 Matt Fish, the pastoral administrator at Holy Family Catholic Church in Hillcrest Heights, Maryland, wrote a detailed twitter thread describing reasoning for the “collapse” of the Catholic Church in America, or the West. 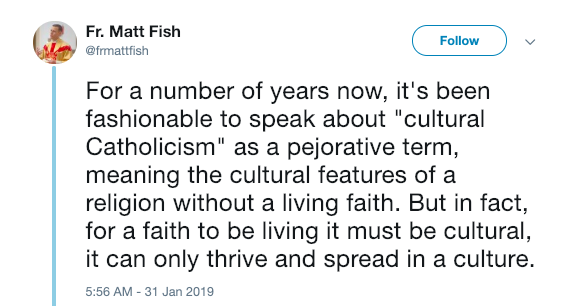 He explained that because our culture has disposed of what is truly “cultural Catholicism,” the Church as a whole suffers from the consequences. Read his Twitter thread below. Screenshots are below the text. 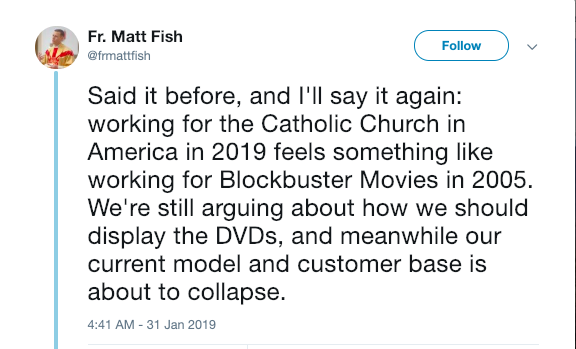 “Said it before, and I’ll say it again: working for the Catholic Church in America in 2019 feels something like working for Blockbuster Movies in 2005. We’re still arguing about how we should display the DVDs, and meanwhile our current model and customer base is about to collapse. 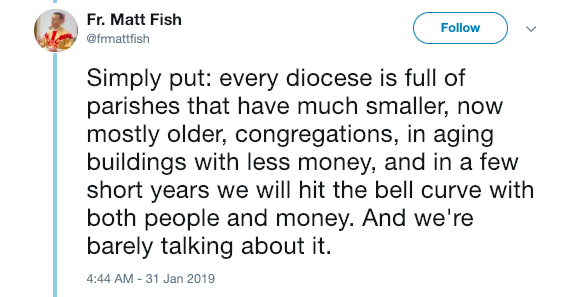 “Simply put: every diocese is full of parishes that have much smaller, now mostly older, congregations, in aging buildings with less money, and in a few short years we will hit the bell curve with both people and money. And we’re barely talking about it. “Our schools are closing, and those that remain are becoming “private” schools for those who can afford them, as we struggle to understand what “Catholic Identity” means for a student body, most of whom do not attend Sunday Mass. 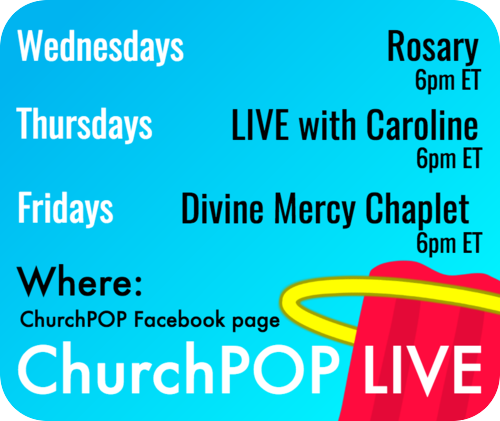 “The average knowledge of the faith in most Catholic communities is at a low point, though it will probably get worse. 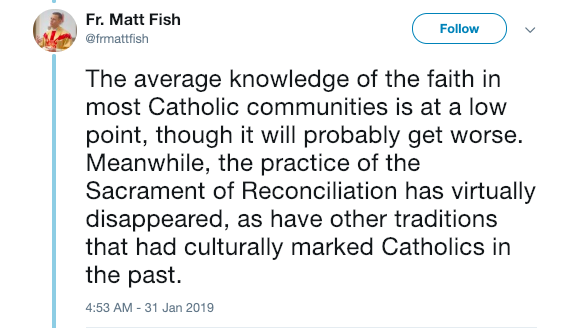 Meanwhile, the practice of the Sacrament of Reconciliation has virtually disappeared, as have other traditions that had culturally marked Catholics in the past. “No need to expand the laundry list. 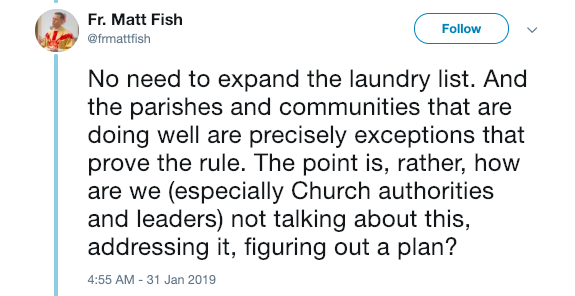 And the parishes and communities that are doing well are precisely exceptions that prove the rule. The point is, rather, how are we (especially Church authorities and leaders) not talking about this, addressing it, figuring out a plan? 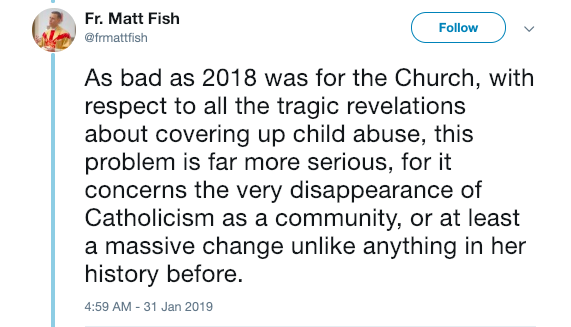 “As bad as 2018 was for the Church, with respect to all the tragic revelations about covering up child abuse, this problem is far more serious, for it concerns the very disappearance of Catholicism as a community, or at least a massive change unlike anything in her history before. “If you believe I’m exaggerating, just ask your diocese for the data from the last 40 years on weekend head-counts, offertory, and sacramental numbers. The change will shock you. And the numbers are about to hit an even steeper curve. “All this is to say, we may disagree with the methods of Rebuilt and Nativity parish in Baltimore, but the reason for their novelty is an appreciation of this stupendous change and problem in the Catholic Church today. “What we have here is the dying, if not decomposition already, of a large, once impressive, Catholic culture. What is needed is the birth and growth of a new Catholic culture. How the two relate I do not know, but can only guess. 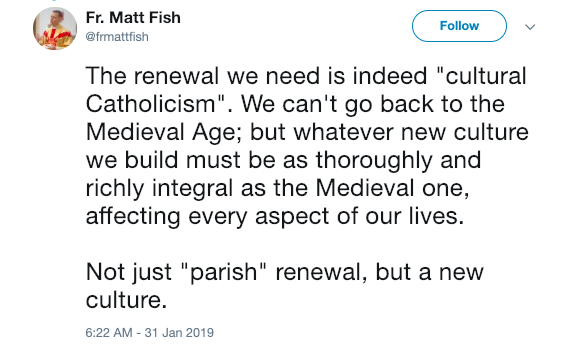 “For a number of years now, it’s been fashionable to speak about “cultural Catholicism” as a pejorative term, meaning the cultural features of a religion without a living faith. But in fact, for a faith to be living it must be cultural, it can only thrive and spread in a culture. “We always exist in a culture, which never fails to shape and form us even as we shape and form it. 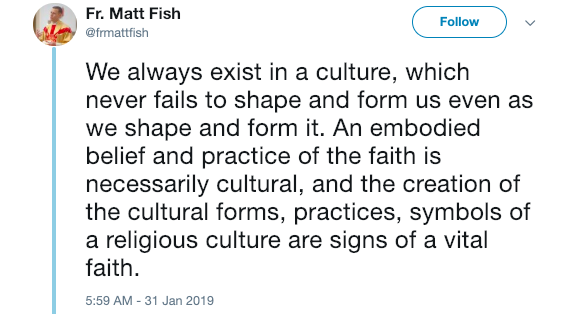 An embodied belief and practice of the faith is necessarily cultural, and the creation of the cultural forms, practices, symbols of a religious culture are signs of a vital faith. 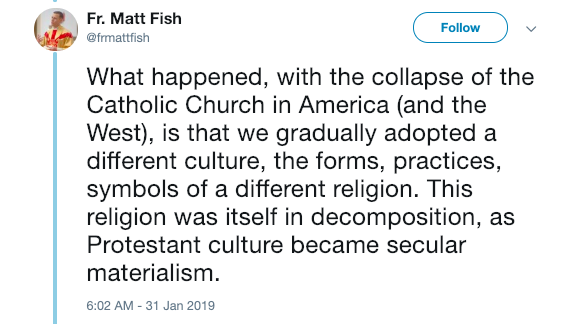 “What happened, with the collapse of the Catholic Church in America (and the West), is that we gradually adopted a different culture, the forms, practices, symbols of a different religion. 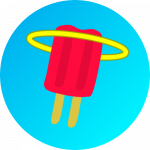 This religion was itself in decomposition, as Protestant culture became secular materialism. 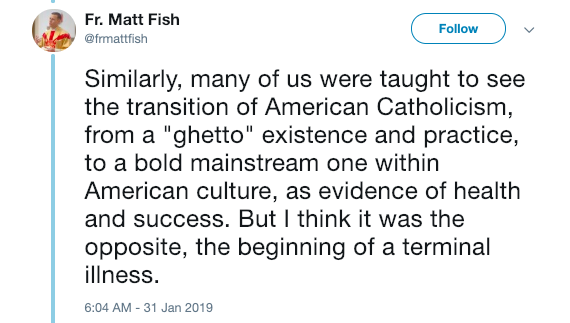 “Similarly, many of us were taught to see the transition of American Catholicism, from a “ghetto” existence and practice, to a bold mainstream one within American culture, as evidence of health and success. But I think it was the opposite, the beginning of a terminal illness. 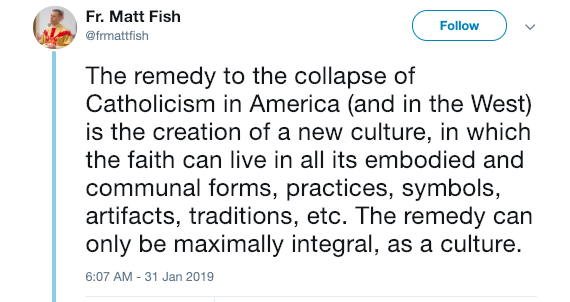 “The remedy to the collapse of Catholicism in America (and in the West) is the creation of a new culture, in which the faith can live in all its embodied and communal forms, practices, symbols, artifacts, traditions, etc. The remedy can only be maximally integral, as a culture. “This cultural matrix is a necessity, because it is necessarily the way human beings live. 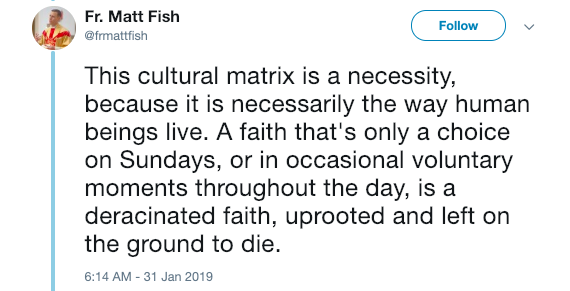 A faith that’s only a choice on Sundays, or in occasional voluntary moments throughout the day, is a deracinated faith, uprooted and left on the ground to die. “What is so brilliant about Fr. @schrenk’s tweet, is that he humorously pointed out what should be so obvious. 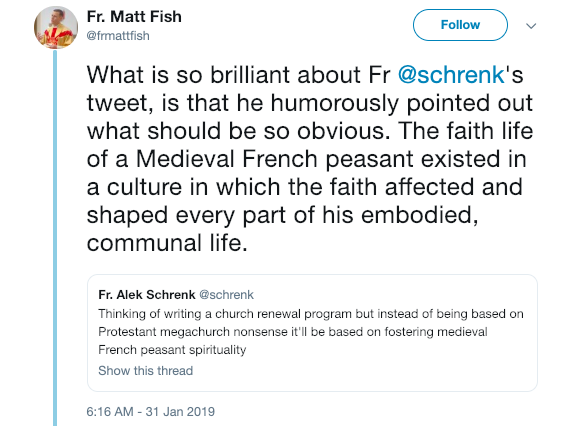 The faith life of a Medieval French peasant existed in a culture in which the faith affected and shaped every part of his embodied, communal life. Fr. 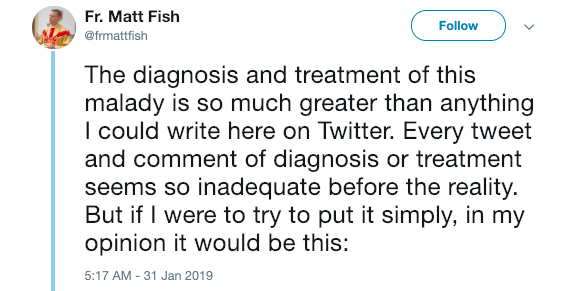 Fish also posted a follow-up thread, explaining that “despite immanent collapse of a passing Catholic culture, I have never seen so many signs of hope.” Read his full follow-up thread here. What are your thoughts of Fr. Fish’s analysis? Do you think he is correct?